This was first posted on May 7, 2008. 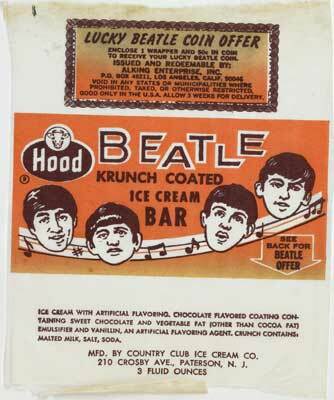 When the Beatles were to arrive in the United States in 1964, a reporter called to ask whether Baskin-Robbins was going to commemorate the event with a new flavor. The flavor was created, manufactured and delivered in just five days, according to the Web site. No…. none of those things. Just tribute. And, yes, a little profit too. The Beatles… probably didn’t miss it. They were a musical act, and song writers, interested in rhythm and blues, not sprinkles and scoops. We’re not against intellectual property here. Not at all. But there was a time when you could have a little fun, even in business, doing something that sounds like “trading on” the name and fame of the phenomena of public life without having to fear cadres of IP lawyers demanding cessation and desistence, claiming confusion as to source-sponsorship-or-affiliation, and reserving all rights on fancy colored letterhead delivered simultaneously by certified mail / RRR and PDF via email. Sounds good to me! Preliminary injunction granted!